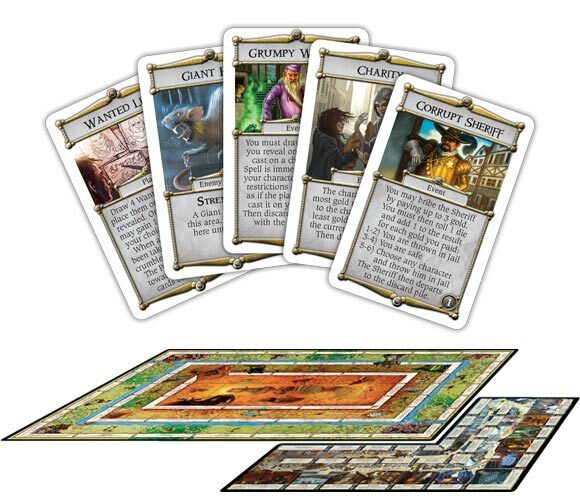 The City, a new Region expansion board for Talisman, provides players with three alternative endings, its own deck, a host of shops for all your questing needs, and six new characters. Collect bounties listed on the Wanted Posters at the City Gate and fill your pockets with gold before doing some serious spending. Secure a steed from the Stables, pick up Pets or Potions, or head to the Armoury and the Magic Emporium. Visit The City in Talisman as you compete for the Crown of Command! Enter Talisman’s City expansion, one of the newest boards and sets to be added to the Talisman family. Just as the Dungeon and Highlands expansions before it, the City expansion adds a new playing field to the board, this one centered on the City space on the board. The City space acts as normal; if you land on it, you can use any one of the abilities listed on the space. But if you have extra movement or move from the City space, you can move into the City board instead. The City board is an interesting place; there is no backtracking, unless forced back to a specific space by a card effect. A player must follow the arrows of movement as indicated by the board itself. This means that a player typically has to traverse the city in a certain way, but there are some locations where a player can deviate from a set path. The City itself is a mass of sprawling streets, which in itself is not hard to navigate. The big difference between any of the street locations and any other locations on the Talisman board is that while landing on a street location causes you to draw a card from the City encounter deck, you can have up to three cards on a location. Which means that while the first run-through of the city might not be as eventful, subsequent trips through the city can yield lots of encounters. In addition, the City has specified locations where players can visit shops or collect wanted posters to collect bounties on for gold. The shops themselves are useful for movement purposes; provided a character has enough movement with the roll of their die, they can end their turn in a shop and spend gold, which can be very useful for nothing else than to avoid an unpleasant space (you can’t enter a store and do nothing; you have to perform a valid action). And let me stress: I LOVE the shops. There’s a potion shop, a pet shop, an armory, an academy, among others…each shop provides a chance for something useful. Of course, you won’t get these items for free (usually). It takes some coin to get the wheels moving, but the items you can get can be really powerful or really useful. One of the most useful (in my opinion) is a pet called Lucky, who will replenish one Fate every turn. In a game where dice rolls can make or break a situation, that is huge. And that is just an example. The City encounter deck also offers some new and refreshing encounters that deal with the City and the main board, including monsters, places, and events. It should be no surprise that quite a few of the City encounters involve money in some way, shape, or form. There are also some events that have the potential to land a character in the City Jail. Not a fun place to be. At best, you will escape to the town square. At worst, you will beaten after repeated attempts to escape and die alone and forgotten. Not the most enterprising fate for one trying to capture the Crown of Command, but it happens. Some events, however, can really land a character “in the money” and can send a character on a sudden spending spree. The City expansion also adds some new characters to explore: The Elementalist, the Tavern Wench, the Tinkerer, the Cat Burglar, the Bounty Hunter, and the Spy. Each of these characters brings something new to the table. The Elementalist offers great versatility with an element of risk; he starts at 1 strength and 1 craft, but once at the start of his turn, he adds 4 to either strength or craft. The right choice can really help in combat and specific tests, but the wrong choice leaves the Elementalist vulnerable. The Tavern Wench has balanced Strength and Craft, but also has the additional benefit of starting with 5 potions (which qualify as trinkets, so take up no space), and can also stop movement when passing another character’s space to stop and force that character to give her a gold piece for a drink (which has certain effects for that character). She also never has to roll for the effects of the Tavern; she just chooses what she wants. The Cat Burglar has very strong Craft, and is specially geared for burgling; she can attempt to procure an item from any place that sells items for free. To do so, she has to roll a contested roll with the item’s price added to it, and she adds her craft. If she succeeds, she gets the item for free. If she fails, the item is discarded and she loses a turn. She also has the interesting ability to choose in what order she encounters multiple cards, which is more useful than you would think. The Tinkerer is an interesting character; the Tinkerer has the ability to create automaton followers from items to follow him around. The Tinkerer can actually still use these items for their original effect (which in some cases destroys the object if it was a one-shot use), and they don’t take up actual inventory space. Also, can turn constructs into automaton followers as well. The Spy is able to peek at the Encounter deck and also peek at another player’s spells in hand. However, I think his most useful ability is the ability to “Shadow” another character in the same region. Shadowing is essentially a teleport ability; the Spy can just move to their location as his move, but does not encounter the space. Aside from just being able to choose a teleport location with a spell, this is by far one of the most useful movement abilities I have seen. The Bounty Hunter has a high strength rating and has the ability to get that precious coin to use in the City; every enemy he defeats earns him a gold piece. He also gets additional rewards if he fights another character, and can even collect a trophy of his choosing from another player if he lands on their space. So what do I think of the City expansion? Lot of fun! But if you’re trying to win the game, travelling to the City is not a requirement at all. A lot can happen in the City, but it’s hard to make the City work for you unless you have coin to spend. You also have to spend time getting out of the City in order to make it to the Plane of Peril, which is your ultimate goal. A good rule of thumb is to follow your opponents’ movements to see if you have time or not to make it to the City and try to make a purchase here or there. It can pad your chances quite a bit, but it might be more worth it to explore the main region and take your chances. But as a friend of mine said, the City expansion gives meaning to all the gold that you sometimes collect during the course of the game but never have an opportunity to use. It also includes several alternate scenarios to flesh out the game with optional directions. For the collector, this is a must-have. For the casual player, this is definitely a thumbs-up. This expansion surprised me. It first seemed like nothing more than a big Walmart for your character. However, the more we used it, the more I appreciated the new (if sparse) mechanics. The bounty hunting is fun, and the pets that can be purchased really drew me in. The components are top notch (its FF), and it has cards galore! Three new special ending cards add some diversity to play, and with all of the help available for purchase, money becomes more important than it used to be. The pet shop deserves special recognition. After purchase, they give special abilities that can really help your adventurer. They work like a follower too, so they don’t count against your items. The only downside is the lack of adventures in the city, but that is really not what this expansion is built to do. Just something to be aware of before buying. Overall, great expansion and well worth the money! 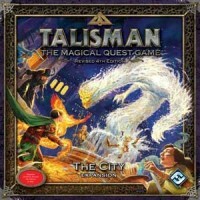 Add a Review for "Talisman: The City Expansion"